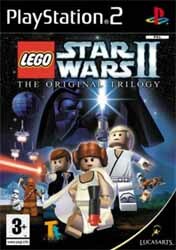 LEGO Star Wars II: The Original Trilogy is an almost text book example of how to improve on perfection. The first game was faultless... but this second instalment is much better. It's actually more enjoyable than sitting through all three movies... once again. You start of in the Cantina Bar with the option to begin your adventures in A New Hope, The Empire Strikes Back or Return of the Jedi. Being a bit of Star Wars nut there was no way I was going to play these out of order, so I headed straight for A New Hope. There are two modes: Story and Free Play. In Story you must battle your way through each movie as you take control of the action from a number of key scenes from each film. The cut sequences throughout are incredibly funny (especially if you know the original trilogy inside out) as are some of the in game sections (try putting a Stormtrooper or Bounty Hunter helmet on Chewbacca. Or how about building a LEGO tractor for Luke - he is a farmboy after all). But it is the attention to detail, coupled with the fact that the gameplay is just hard enough to make you have to think but not too hard that you get frustrated and give up, that will keep you glued to the TV screen for hours at a time. As you move through each level you encounter familiar enemies from the movies. These can be dispatched by using your weapon, or hand to hand combat. Each level has a number of problems to solve - which usually involve building a construction out of LEGO that will help you progress further. In Free Play mode, you have the opportunity to experience the original trilogy by importing any character into land levels, or switch between vehicles at will in space levels. Make Darth Maul a hero of the Rebellion, or destroy the Death Star with a TIE fighter. If you have saved characters from the first LEGO Star Wars game you can also use them here - which is a nice touch and helps to expand your own personal LEGO universe. But if that is not enough for you, you can also mix and match the body parts of more than 50 playable characters to create your own personalised LEGO Star Wars heroes. Each character has their own specific attack. These include Chewbacca pulling enemies' arms out of their sockets, Vader's Force choke, and Leia's "slap" melee attack. And once you've played as a character in Story Mode you have effectively unlocked them to play in Free Mode. The only real complaint I had was that the camera angles take a bit of getting used to - and on certain levels they make it difficult to see key sections of the room you are in. If you enjoyed the first game then you'll need to add this to your collection. And if you haven't played the first instalment, I strongly advise you to pick up this sequel. More fun than bullseyeing wamp rats in your T-16 back home.